REVIEW: Rob Lunn sketches with this no-brainer set of top-quality pencils that are right on point. 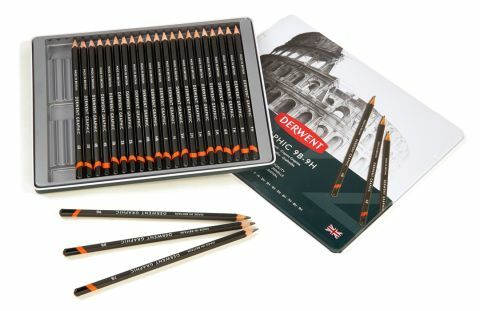 Easy to hold and with a lovely balanced feel, these Derwent pencils are a joy to sit and sketch with. Like many others, I have fond memories of the Cumberland Pencil Museum in Keswick, the historical home of Derwent pencils in the UK – paying homage to the world’s largest pencil is draw enough (no pun intended) for an addicted scribbler like me. Graphite has been mined in the Lake District since the 1500s and Derwent has been producing pencils in Keswick since 1832, so they should know a thing or two about how to make a good one. This substantial set comes in a sleek tin measuring just under 24x20cm. Included in this neat package is an impressive range of degrees from 9H right through to 9B, including B, HB, F and H, plus two of each of our well-used favourites 2H, HB, 2B and 4B. The pencils are hexagonal in shape, so they’re easy to hold and manoeuvre, plus they have a high-quality matte feel. The cedarwood shaft has a very fine grain and texture that makes sharpening them a doddle, even if, like me, you enjoy using a scalpel to whittle your points. The cores also have an improved strength to help prevent those annoying messes when you sketch a little too enthusiastically. With such good-quality graphite, the pencils have a lovely balanced feel to the marks you make – not too waxy and not too dry. It’s a real joy just to sit and doodle with them. While the size of the tin might make them slightly too big for a mini sketching-set, it’s still slim enough to fit into most backpacks easily, and with the addition of an eraser, sketchbook and sharpener, you’re good to go. Do Derwent make the best pencils in the world? I’ve tried lots of pencils, but I find myself coming back to Derwent again and again. This article originally appeared in Paint & Draw magazine issue 02; buy it here!